For some time, more than a year I'd say, my family has made a concerted effort to consume some kind of probiotic-rich food at every meal. Even snacks. This is an attainable goal for everyone — and a very important aspect of a healthy, nutrient-rich diet. Many of the Fundamentals eCourse lessons produce probiotic rich foods in the form of fermented beverages, raw cheese, or lacto-fermented vegetables. The base foods can be eaten by themselves, or as an element of another dish or recipe. What is a probiotic food? A food that contains beneficial bacteria or yeasts — organisms that are good for the gut. As a bonus, those foods usually contain enzymes, too! The series will cover all the major meals and then some: breakfasts, lunches, dinners, snacks, and desserts. 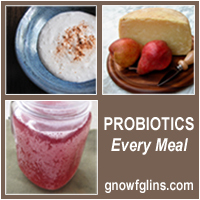 I will list as many ideas and recipes as I can for how to get probiotics into that meal or meal type. The probiotics will always be raw, as cooked beneficial organisms don't do us any good. 🙂 I'll also place a special emphasis on kid-friendly options. There will be gluten-free, dairy-free, and egg-free options, too. For all our sakes, I need your help! Are you a blogger? Get your old or current posts featuring probiotic-rich meals or recipes ready to link up. Even using a probiotic condiment, such as lacto-fermented mayo or ketchup, counts. So, when I put up the post for probiotic breakfast ideas — link up any (or many) posts of yours that have a probiotic breakfast idea or recipe. And so on. Got it? Gonna do it? Good! I'll end this post with a great quote from a Wise Traditions article by Tom Cowan, MD. Have you ever wondered what beneficial organisms and the gut are really all about? Wonder no more. Ohhh! love it! I’ve built up quite the colonies in my kitchen. I’d love to participate and learn more. Now this is exciting! My kitchen has become “alive” with things fermenting and growing in the last year or so. I love finding new ways to use my happy bugs! Oh, goodie! I’m so glad you two will be participating. Thanks! I do have a question though? I am just wondering if anyone out there has had any problems with all of these probiotics. My body seems to be having a hard time with it all. I have been doing a lot of raw veggies, kefir and sourdough. I tend to be sensitive to, too much of anything, even if it’s a good thing. I can’t wait for this! This is exactly what we need. This and learning to do more sprouted grain gluten free baking. These will be my two ktichen challenges in the next 6-12 months! Maybe after adding more probiotic foods we’ll be able to try your spelt bread and sourdough recipes.Thanks Wardee for all your wonderful ideas. You are a blessing. teaching and helping us. I need to eat more probiotic foods so this is going to be great.